Altogether 12 passengers had a miraculous escape on Thursday when the vehicle carrying them hit a divider and met with an accident at a place in between Mupa and Langting at NH-27 in Dima Hasao district. Passengers travelling in the Sumo (AS 02 AC 0315) that met with the accident alleged that the driver was in an inebriated condition. 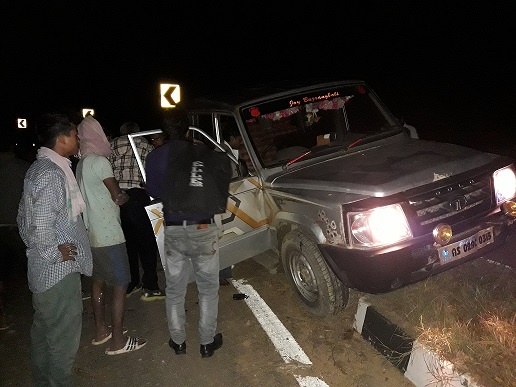 The vehicle was moving from Haflong towards Lumding. One of the passengers of the ill-fated vehicle Munna Sheikh alleged that the driver was drunk when the vehicle started from Haflong. After crossing Maibung he had another liquor session. The passengers though tried to resist the driver from having another liquor session, he was in a defiant mood and continued with the same. It was just 8 km to Langting when the driver lost the control of the vehicle and hit the divider on the NH-27. Narrating the incident, a college student from Maibang who was on her way to home at Langting expressed her gratitude to the Almighty for saving her life. “The driver was in an inebriated condition when the vehicle started off from Haflong and eventually he lost control of the vehicle,” she said. Arobindu, the driver of the Sumo, on the other hand, denied that he was drunk while driving the vehicle. Though he denied the allegation, he was too tipsy to stand on his feet and tried to flee from the spot. Langting police led by OC Gunajit Pathak, however, apprehended him. Police also rushed the injured passengers to the Langting health centre for check up.